4 Bedroom Detached House For Sale in Southampton for Guide Price £2,000,000. Hill Top is an impressive property designed and built by the current owner approximately 30 years ago. 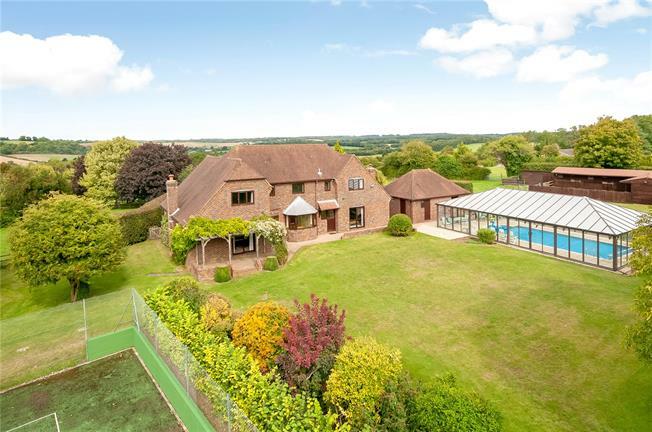 It has served as a much loved family home providing a wealth of space throughout the 3000 sq.ft house, over 2600 sq.ft of outbuildings and 6.7 acre plot with wonderful views over the surrounding countryside of the South Downs National Park. The accommodation within the main house is well balanced over the two floors. On the ground floor there is impressive entertaining space with a 22ft triple aspect sitting room with wood burning stove, patio doors on to the rear terrace and double doors connecting to the formal dining room. There is also a 27ft, triple aspect games/family room with another wood burning stove and a further set of patio doors to the rear. Overlooking the rear garden is the well-appointed kitchen/breakfast room comprising modern units which is complimented by the adjacent well-proportioned utility room. A study and ground floor WC complete the accommodation on this level. On the first floor there is an attractive master suite with wonderful views over the rear garden. The bedroom is divided to provide a dressing area and has the benefit of a bank of fitted wardrobes and an en suite shower room. The guest suite also benefits from fitted wardrobes and a further en suite shower room.Bedrooms three and four both boast superb views to the front over the front gardens and the valley beyond and are served by the family bathroom on this level. In addition to the above it is considered that further scope exists to extend the property should a buyer wish to do so, subject to obtaining all the necessary permissions and consents of course. The position and location of this property is undoubtedly one of its most significant features, offering the best of both worlds with the sense of country living whilst still having excellent communication links. Set on high ground, just 1.5 miles from Bishops Waltham town centre with its wide range of amenities including independent boutiques, cafes, restaurants, pubs, Doctor’s surgery, post office, banks, supermarket and church. More comprehensive amenities can be found in the cathedral city of Winchester (10 miles) whilst rail links to London can be found at Botley (5 miles). The M3 and M27 motorway networks are also within easy reach, providing access to the commercial centres of Winchester, Southampton and Portsmouth and the south coast. Furthermore Southampton International Airport is just 11 miles away providing domestic and international flights. Falling within the South Down National Park, the property boasts some outstanding countryside views, particularly to thefront of the property, whilst to the rear is Dundridge Valley, a designated SINC, area offering wonderful walks. The area offers a wealth of countryside pursuits with fishing, golf and equestrian facilities all nearby. The property nestles within very private grounds which total 6.7 acres. A long sweeping, tree lined driveway leads up to the property and the detached garage. The house and formal gardens occupy approximately 2.25 acres of the total plot with the gardens predominantly being large swathes of lawn edged and interspersed with a wonderful range of mature trees and shrubs which provide colour and interest throughout the year. The formal gardens also include a detached pool house with heated swimming pool and a tennis court. The remainder of the grounds are set as paddocks flanking the house and gardens which are served by an L shaped stable block equipped with power and light and consisting of five loose boxes, tack room and two stores. Total plot of 6.7 Acres of which circa 4.5 Acres is paddock, detached triple garage with WC, pool house with heated swimming pool, tennis court, stable block with five boxes, tack room, store and wood store. Views front & rear.